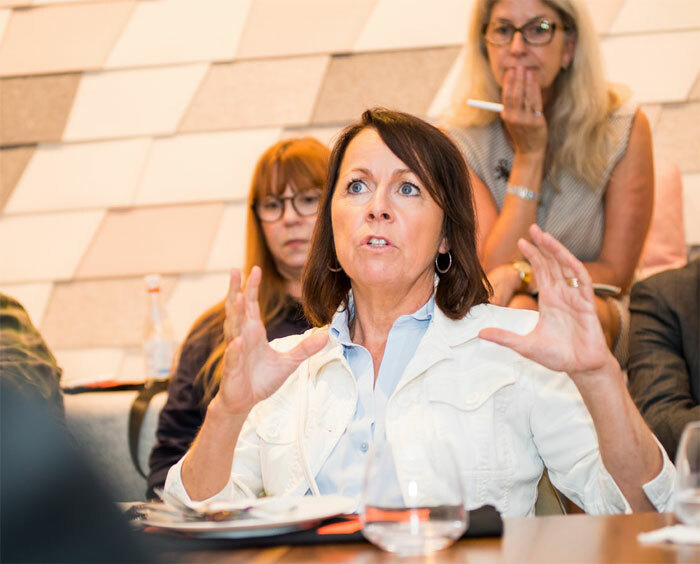 Workplace Planning for Today and Beyond - SSDG Interiors Inc.
Knoll Inc. recently hosted member firms of ONE Global Design, including SSDG, to discuss trends, the design needs of corporate clients and the changing nature of work across the globe. 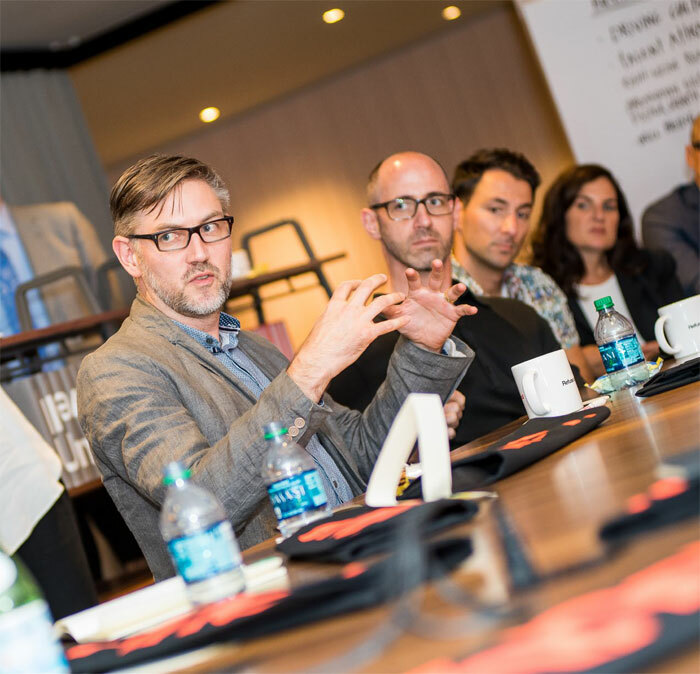 Knoll has published a paper that offers insights from the roundtable, including five key drivers in workplace design. The following are the findings via Knoll.com. Download Workplace Planning for Today and Beyond. Today’s workplace is so much more than an environment in which to work. It’s a tool that can drive organizational change, improve performance and productivity, bolster employee engagement and attract, retain and motivate talent. It’s also a strategic asset that can communicate corporate mission, branding and cultural messaging. Such a broad agenda makes the job of planning for tomorrow’s workplace that much more complex for designers who are charged with balancing business and real estate needs while creating solutions that align with corporate mission and deliver competitive advantage. 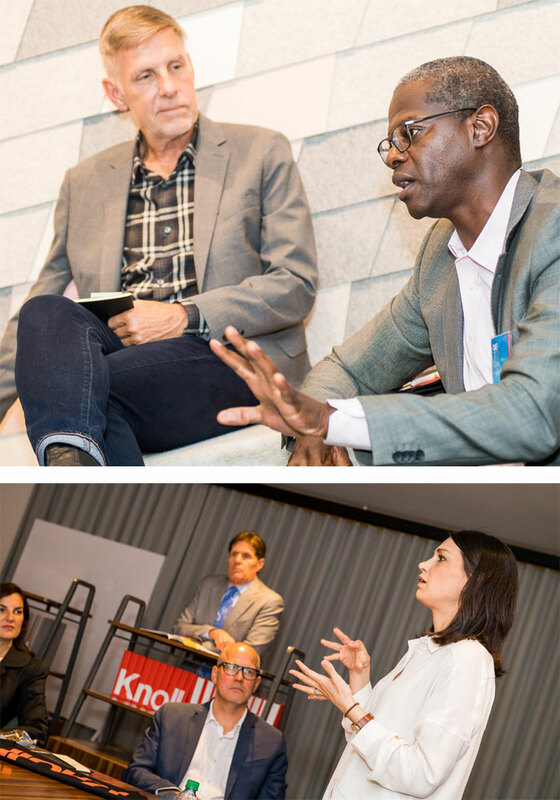 Recently Knoll hosted members of ONE Global Design, a consortium of owner-led interior design firms in the U.S., Canada and Mexico, to discuss some of the challenges they were experiencing, trends observed and current and future design needs of their corporate clients. Leveraging the broad geographic diversity and deep expertise of the ONE Global Design network, our discussion goals were to better understand the changing nature of work, especially the global escalation of group-based work, shared-unassigned workspaces and how organizations are planning and allocating space and using furniture to support new ever-more casual workstyles. “Everyone wants to be cool,” was the general consensus about corporate clients today. Aesthetics are strongly influenced by clients’ desire to model technology companies, an industry that many clients relate to. That identity, combined with a continued shift to groupbased workstyles and casual work environments, has given rise to a preference for a more hip design sensibility. Even traditional legacy companies increasingly view themselves in a more modern context, and want their space to reflect that ambiance, even if they can’t quite articulate it. “We just did an insurance company that decided to call themselves a technology company. Everybody is a technology company now. They came to us and said, ‘We want an innovation center. We need a garage, a digital garage. What is that?’ They had no idea,” one designer recalled. Today’s workplace is looking less and less like an office and more like a home or hotel, designers related. Seeking a more informal aesthetic that encourages collaboration, and inspired by the hospitality industry, designers are bringing a more casual vibe to workspaces in numerous ways. Bike parking and corresponding end-of-stay rooms with showers and changing areas. Rapid and continuously evolving technology, new industry standards and tightened real estate priorities were identified as major challenges to creating effective and economical space solutions. An uncertain business climate requires a need for adaptation. With markets in flux, rapidly expanding (or contracting) businesses, and workplaces in transformation, the need for flexibility and agility has never been greater. Designers shared solutions to respond to a client’s growing needs, such as testing new workplace changes prior to a wide rollout. “Bigger corporations with a large real estate mandate take a ‘chunk,’ rather than doing it across the board. They pilot it saying, ‘Let’s try this out in 2% of my world and see how it takes off,” shared one designer. Another strategy was an “incubated playground area” with inherently flexible furniture solutions that allow employees to shape their environment to match a particular need or posture. “The kit of parts is designed with flexibility so someone can take a component of the conventional workstation and turn it into what they need it to be,” another attendee explained, adding that following installation, clients frequently observe components being used in unintended ways. Corporations are adopting coworking models. Coworking is growing up, the designers concurred. Companies in search of innovation and employee engagement are rapidly adopting workplace designs inspired by coworking’s collaboration and community. Models vary as well. In some cases, a company takes up residence in an existing coworking space such as IBM has done at WeWork. Other times, companies create their own coworking spaces as part of a new real estate strategy, as Verizon has done in an effort to monetize its dormant building spaces. Hybrids might incorporate an incubator, accelerator, university or other partnership. 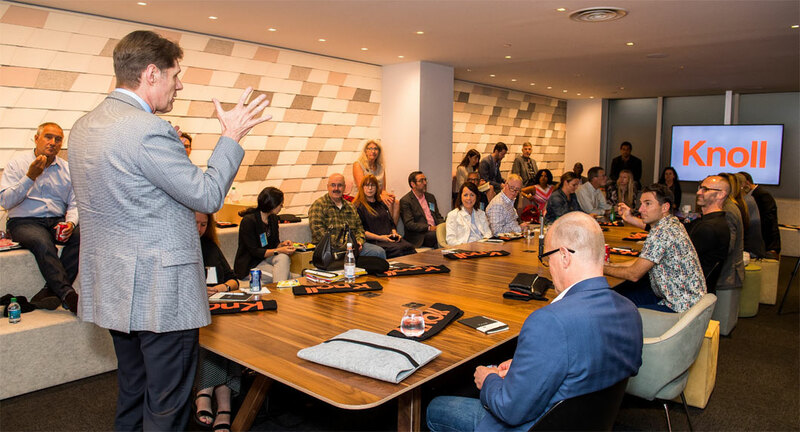 No matter what the model, coworking success is contingent on community-building, one designer reminded the group, underscoring the need for spaces that support collaboration and event programming. Industry standards present challenges and complexity. Designers were in general agreement about how to address challenges with industry-wide standards, whether it was the long-established LEED for sustainability issues, or the more recent WELL building standard aimed at creating healthful environments. “WELL needs to be part of culture,” particularly in light of the cost to do so. Compliance is typically more expensive per square foot than LEED, the group noted. Expense and complexity have led to a change of mindset for LEED standards. “It’s become more about intent (or “LEEDlite”) than compliance,” as one participant suggested. The cultural components must be addressed. No amount of groundbreaking design can solve the less tangible challenges an organization experiences. Getting the numbers right in designing a free-address environment is not a perfect science, designers concurred. Rather, it’s akin to the software 2.0 model, which focuses on getting to market first and making adjustments later. In the case of workplace design, that often means doing a pilot study, then refining the design before rolling it out company-wide. Continual monitoring and tweaking elements to make sure they are working optimally should follow installation. Determining the ratios right can be tricky business. Getting the size of rooms can resemble a Goldilocksstyle dilemma. Spaces that can accommodate three or four people were optimal, since “everybody is much more inclined to use those spaces.” Building in flexibility via modular design and agile furniture is the best solution, since it allows an easy transition from one use to the next, such as small enclosed spaces that can be used as individual offices or meeting rooms, depending on demand. Several key takeaways emerged from the afternoon to guide future success. Know your customer. A thorough research phase to learn how your client works before you design the space is integral to project success. Equally important: make sure the customer knows what they want. Test, revise, rollout, repeat. Start with a pilot area to make sure new strategies work for the client. Conquer fear of change. One of the most effective strategies is to have clients learn from others’ success. Explore, visit, share knowledge. Use technology to optimize space. Cell-phone apps and sensors can track usage and availability of open workspaces, meeting rooms and locations for more accurate planning and optimal utilization. How to accommodate personal items in a free-address environment? Sure, people can look at their family photos on their phone or computer. But what about the latest artwork from their kindergartner? Or the treasured departmental award plaque? Data drives decision-making. But at what price? Not everyone is comfortable being tracked by sensors that monitor their every move. How to account for different reconfiguration needs? When cross-functional teams meet around a table, technology portability may not be an issue. On the other hand, some industries, such as gaming, necessitate that power, infrastructure and furniture be kept intact as the teams move around. How do you address unassigned workspace issues? How can you best create a home-like environment in a deliberately anonymous setting? How do you accommodate large teams? What happens when people “camp out” in spaces beyond their reserved time? Where do people store their stuff? How do you provide individual space in an open environment? How much more can the boundaries blur? Long-work days, remote workstyles and home-like offices blur work/life boundaries more than ever. Is it too much? What are the long-term effects?